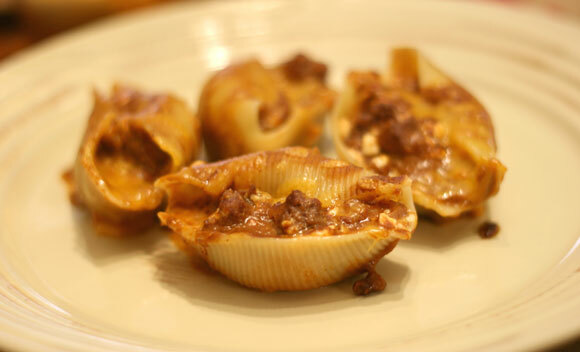 Taco Stuffed Shells are a different take on the typical stuffed shell recipe. These are filled with beef and cheese and smothered in enchilada sauce. Cook shells as per box instructions, set aside. While the pasta is cooking, brown beef over medium/high heat in a skillet. Drain off any excess fat. Add taco seasoning, salsa and water. Simmer for 5 minutes. Mix together cottage cheese, 1 cup cheddar cheese and beef mixture together in a large bowl. Stuff the shells with the beef and cheese mixture. Place them in the prepared casserole dish. Top with enchilada sauce and remaining 1 cup cheese. Bake until bubbly, about 30 minutes.